Over the past couple months, I have fielded a number of calls and emails related to Bitcoin’s meteoric rise in price. These calls and emails request my advice and insight into what I think about Bitcoin. So, I thought this newsletter would focus a little more of my attention on Bitcoin. My intent is to give my honest opinion as a trader and an investor. Both are not one in the same, although many take it as such. A trader typically tries to profit from short-term price volatility. The positions a trader holds could last anywhere from a couple of seconds to weeks. On the other hand, an investor is someone that takes a longer-term approach to the markets. Short-term volatility typically does not play into their strategy. Back in the 1990’s the Federal Reserve provided easy monetary policies which helped create the gigantic technology stock bubble of 2000 that eventually erupted, and pushed the US into recession. In order to combat the recessionary pressures, the Federal Reserve decided to push interest rates to historically low levels of 1%. This eventually set the stage for the housing bubble and massive credit binge. As history shows, this led to the 2007 housing crisis, which then caused the Global Financial Crisis. The Global Financial Crisis was the worst recession since 1929. It caused the Federal Reserve to once again, step in and cut rates to 0%. But, this didn’t work. So, the Federal Reserve decided to take an alternate course in monetary policy. They decided to print money. This money printing scheme was called Quantitative Easing. This wasn’t the first of it’s kind. Money printing has been tried a number of times in history, but it has always failed. The difference this time is that the amount of money printed is unprecedented. Unlike the monetary policies of the 90’s and 2000’s which provided asset bubbles in very specific asset categories, such as technology stocks and real estate, the current monetary policy of the Fed has caused asset bubbles in almost every asset category throughout the world. Last month a Leonardo da Vinci portrait sold for $450 million or 2 1/2 times the record amount of any painting ever sold. I don’t know much about art, but $450 million seems like a lot of money for oil on canvas. But, there’s one bubble that’s on everyone’s mind. It’s a bubble that makes the Dutch Tulip Mania or the South Sea stock bubble pale in comparison. It’s like nothing I’ve seen or read about before. It’s the insane world of cryptocurrencies. At the beginning of 2017 Bitcoin stood at $950. It’s up over twelve-fold in just over 11 months. Since November 12, 2017, it has doubled in price. During the dotcom mania one of the fastest growing bubble stocks, CMGI, blasted off 904%. Guess what? Bitcoin destroyed it. Less than six months ago the total value of the cryptocurrency world was just over $100 billion. It’s now worth $327 billion. I think everyone understands why it’s the talk of the investment world. As any trader will attest low volatility doesn’t make for a good day in the markets. As we have seen this year volatility has all but dried up. We are at historical lows for volatility. I won’t rehash the whole volatility trade, as you can read about it in November’s newsletter. My point is is that for a trader to make money there needs to be some short-term price volatility. Where have traders been able to find volatility, speculate, and make money? Correct, cryptocurrencies. It trades aggressive, it moves a ton, and the structure of the chart makes many technical analysts drool. There have been some amazing setups to make an amazing amount of money. Many have. Cryptocurrencies have been great speculative plays to take advantage of short swings in price. 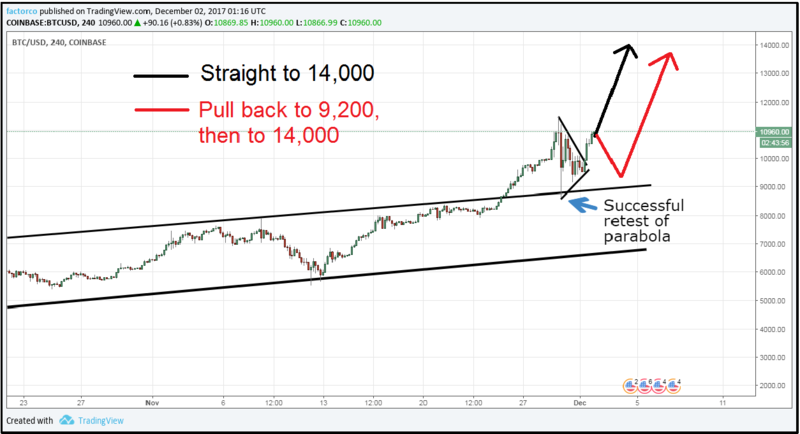 A brilliant technical analyst by the name of Peter Brandt has been very involved in setting the stage for short-term opportunities in Bitcoin and Ethereum. Below is a great example of the type of trades he touts. He has been incredibly accurate due to very well known technical setups that stand the test of time. His most recent call is below. As I write this newsletter the price of Bitcoin stands at 12,741. Peter might be spot on once again. Now, with all that said I’m not advocating that you go out, set up a coinbase account and get your speculation on. You better be damn good at speculative short-term trading and understand what you’re trading. Ya, some people get lucky, but mother market has a knack for knocking the luck right out of you when you least expect it. My bottom line is that this market has been a breeding ground for professional short-term traders and some lucky traders to profit from. I have no problem with it, so if you know what you’re doing and you’re making money, keep killing it. From a trading standpoint, I don’t have any negatives to complain about, except that some novices need to be careful with trading this speculative market. So, let me tell you what Bitcoin isn’t. But, Ghostface Killah Has One. The prospect of infinite riches from Bitcoin has lured some of the entertainment elite. These include Paris Hilton, Mike Tyson, Dennis Rodman, and the rapper Ghostface Killah. Many of them backing various cryptocurrencies with suspect business prospects with names like Cream and PotCoin. Some notorious individuals such as James Altucher (tech bubble cheerleader) and John MacFee are calling for Bitcoin to be worth $1 million by 2025. But, is there any lasting benefit to Bitcoin besides the blockchain technology? I guess no one knows for sure, but I have my opinion and Fred Hickey says it beautifully. I have a vivid memory of seeing this type of scenario play out. It happened to me early in my career as a futures trader. As I mentioned, I started out trading the Dow Jones Futures contract in the Chicago Board of Trade pits in the early 2000’s. At that time the Dow was trading around 7,500. I started trading in the pits right after the tech bubble. This scenario was a little different in that the Dow wasn’t in any sort of bubble, but the concept is the same. I remember the day like it was yesterday. I stepped into the pit around 7 am and stood by my normal position, the second step from the top. On very rare occasions I would hold positions overnight if I had a good reason to. At this time, I had a good reason to. I was short 5 Dow Futures contracts. At that time the Dow Futures would move in 5 tick increments. Each tick was worth $10. That meant that every move made or cost me $250. I wasn’t a big trader, but the position was sizeable to me. The charts told me that the slide was going to keep going. We had an economic number that was coming out early in the day at 7:15 am. I remember hearing that this particular economic number would be in line with expectations, so I kept my short position. 7:15 am came and the economic number came through much better than expected. The Dow rocketed up. Shorts tried covering. We couldn’t. The market was moving too fast. I tried to find a seller. Nothing. My stomach dropped. I felt physically ill. The market kept moving skyward. After what felt like forever I was finally able to offload my position with the largest loss of my career. I guess my point in telling this story is that this type of spiraling trade happens all the time. The difference is that bitcoin may be the biggest bubble of all time. When it does pop those that are still in the swimming pool will drown. Those that trade or invest in Bitcoin, be safe, smart, and keep those gains. The old tried and true, Gold, might be your best line of defense. I want to personally thank all of my readers for your support. Here’s to hoping everyone has a wonderful Holiday Season! Paul Tudor Jones: “Markets arereminiscent of thebubble of 1999 and on the verge of significant change. ETF buyers are making the same mistake that led to the financial crisis.